Lacey Jensen is the eighteen year old daughter of Jim and Angie Jensen. She is a senior at Underwood High School where she participates in Cross Country, Basketball, Track, Dance Team, and Student Council. After graduation she plans to attend Creighton University in Omaha where she will major in nursing. Lacey hopes to attend Medical School after she earns her degree where she plans to become a radiologist. Lacey grew up riding horses with a love of rodeo and the western way of life. 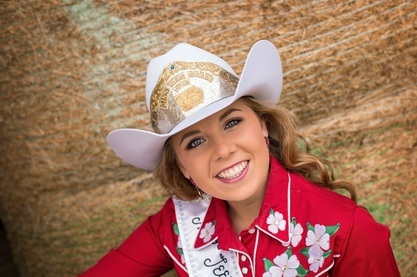 From the age of 7 when she was “Little Miss River City Roundup” she has always loved being able to share her love of rodeo with others and since has also served as the Leon Rodeo Princess 2011, and Miss Leon Rodeo 2014. Outside of rodeo, Lacey enjoys being a member of the Arabian Horse Association, Arabian Horse Society of Iowa, and the Ride n’ Tie Association. Each year she participates in the 20 mile, One Heart Equestrian Therapy Benefit Ride n’ Tie endurance event in Maxwell, Iowa. She also competes weekly at the Speedhorse Productions barrel racing series located in Carson, Iowa. Lacey looks forward to meeting new and old rodeo fans alike in her travels as Miss Teen Rodeo Iowa.